Elemental Adventure was founded by James Morland in 1999 and is the product of a passion for skiing and adventure in beautiful, remote places, untouched by the modern world. James is involved in all aspects of the business from guiding on the slopes of Iceland and BC to answering your questions on the phone. An Elemental Adventure is about experiencing the elements not from a distance as a tourist but by being part of them and their environment. From the bubbling volcanoes and molten lava flow of Kamchatka to the deep emerald waters of an Alaskan fiord we strive to offer you a genuine, ‘real’ experience that will remain with you forever. We are passionately obsessed with skiing and have been involved in the industry for nearly two decades. 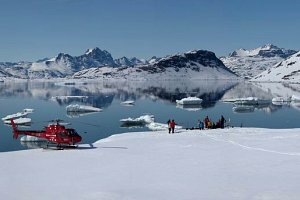 We have either guided or skied at every destination on this website (and many more), we know the world of heli-skiing inside out and it is always a pleasure to share our knowledge and experience with you. Over the years I have been fortunate enough to do many hundred ‘runs of a lifetime’ but what I enjoy more than anything is seeing the looks of sheer delight and intoxicated happiness on our guests’ faces - knowing that I have played a part in creating a special memory. I can never get bored of that and it is a big part of why I love what I do. Before starting Elemental Adventure James worked as a professional ski patroller in Canada and New Zealand, managed remote fishing lodges in Arctic Russia and took guests sailing all round the world from Alaska to South East Asia. He has a degree in psychology, is certified by the Canadian Avalanche Association to level 2, is an RYA Yacht Master and is part way through becoming a guide with the Association of Canadian Mountain Guides. Today he is involved in all aspects of running the business right down to the grass roots of guiding. After spending time in both Canada and Japan, Jonas decided to get himself a degree and pursue his dream to become a professional adventure seeker… four years later after spending time in both the UK and Hong Kong Jonas graduated with a business degree and soon after (September 2014) he joined Elemental Adventure.